Reporters from Reuters, Wall Street Journal, and Radio Free Asia (RFA) were present at the Foreign Correspondents’ Club to cover Brownback’s speech, as well as local media journalists from South China Morning Post, Oriental Daily, and Local Press. Days before Brownback gave his speech, Hong Kong-based media Apple Daily did report on the upcoming event. At the time of writing, however, Apple Daily has not published a subsequent report covering the speech. With other Hong Kong media remaining silent, the Hong Kong bureau of The Epoch Times was the only local media to have reported on Brownback’s speech. The English-language Epoch Times also provided international coverage. Beijing is known to strictly control media coverage inside China, and there are signs that Beijing’s influence is increasingly creeping into Hong Kong. Hong Kong, a former British colony, returned to Beijing rule in 1997 under a “one country, two systems” principle, which guarantees the special administrative region a high degree of autonomy and freedoms, including freedom of the press. But post-1997, Beijing has not kept in line with the principle. In recent years, following the pro-democracy Umbrella Movement of 2014 garnering worldwide attention, the Chinese regime has cracked down further on democracy activists and the press. In October 2018, the Hong Kong government refused to renew a work visa for Victor Mallet, the Asia news editor of the Financial Times, who also served as the vice president of Hong Kong’s Foreign Correspondents’ Club. 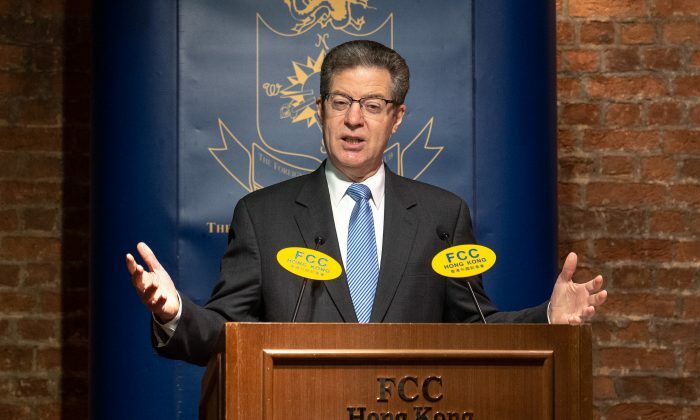 This time around, Hong Kong media may have been treading carefully because Brownback mentioned the plight of Falun Gong—a topic considered taboo in China. Falun Gong, also known as Falun Dafa, is a spiritual discipline that grew in popularity during the early 1990s. The number of adherents embracing its moral teachings and meditative exercises totaled more than 100 million, according to official estimates. The popularity was quickly viewed by then-Chinese Communist Party leader Jiang Zemin as a threat to his rule. In July 1999, Jiang launched a nationwide persecution of Falun Gong adherents. Since then, hundreds of thousands are estimated to have been arrested and detained within prisons, labor camps, and brainwashing centers, while thousands have reportedly been killed due to torture, according to Minghui.org, a U.S.-based website that tracks the persecution of Falun Gong in China. Hong Kong residents are not optimistic about the city’s media landscape. The University of Hong Kong, published a survey in September 2018 in which it found that 56 percent of those polled believed the city’s local media practice self-censorship, a record high since 1997.